The Thanksgiving table is a smorgasbord of foods, flavors and family members. It’s a time worthy of some delicious wine picks as well. But what wine goes with what food? What’s good for a big family with an aunt who only drinks white wines and an uncle who will only drink Merlot? Choosing the right wine can be overwhelming, but Wine.com is here to help. 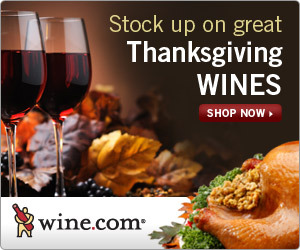 Shop now for great Thanksgiving wines by clicking on the banner above. • NOVGIFT: Save 5% on any gift basket. Coupon codes may not be combined on one order, and expire November 30, 2010.